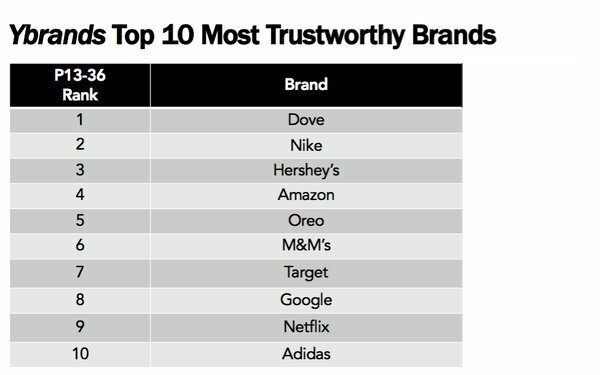 Dove, Nike and Hershey’s take the top three spots in “most trustworthy” brands among consumers ages 13-36, per Ybrands. Rounding out the top 10 are Amazon, Oreo, M&Ms, Target, Google, Netflix and Adidas. The list is an “interesting mix in that, I think, young people ascribe trustworthiness to a brand for a variety of subjective reasons,” says Bobby Calise, Ypulse’s vice president of Ybrands, its youth brand tracking product. Megabrands like Amazon, Target, Google, and Netflix are so ubiquitous and popular that young people innately trust them, he says. Ybrands surveys 80,000 young consumers (ages 13-36) annually about their perceptions of 230+ brands across five verticals: fashion/apparel, CPG food/beverage, health and beauty, QSR/casual dining and media/tech/entertainment. The company also focused on fashion brands, looking at what consumers deemed “coolest” as well as “most trustworthy.” There was some overlap. Nike ranked tops in both categories while Nike’s Jordan brand was second in coolest but fell to 8th in most authentic, where Levi’s took the second spot. Adidas ranked third, Vans ranked fourth and Under Armour ranked fifth on both lists. Rounding out the top 10 coolest fashion brands are Converse, The North Face, Supreme, PINK and Timberland. Ranking fifth through tenth in the most authentic fashion brands category are the North Face, Target, Converse and Fruit of the Loom. Supreme's ranking as the #8 coolest fashion brand is driven by its popularity among 18-24-year-olds (#5 among this demo), as streetwear has become more prevalent, Calise says. Levi's falls just outside the top 10 on “cool” but is the second-most authentic fashion brand, he notes.